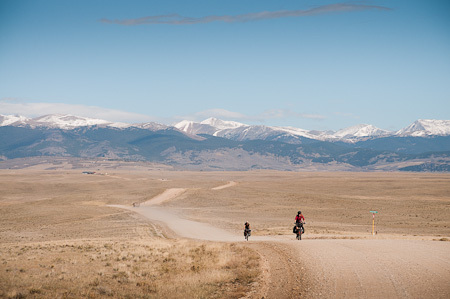 This Coloradan leg of the Great Divide Mountain Bike Route continues to amaze and delight; a seemingly unending patchwork of dirt roads linking backwater settlements and their quirky mercantiles, through land peppered with sublime camping spots to rest weary heads. We’ve been lucky with the weather too, basking in wall to wall sunshine for the last week. Leaving Como. An open road and Dire Straits' 'Telegraph Road' on the iPod. Nancy and Greg hit dirt once more. 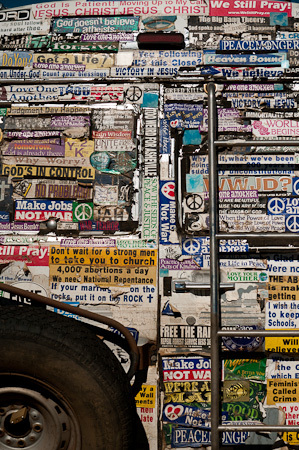 As well as the eclectic South Park Mercantile Co and a wacky Mexican restaurant, it entertained us with this Godly-festooned truck. JC's in the driving seat here. 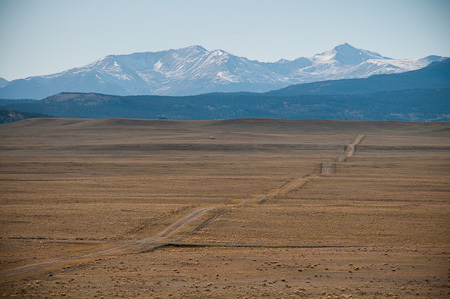 Blips in the magnitude of Colorado. By now our travelling tribe numbered five: Nancy, Layl, Nicholas, Greg and me. Surly were well represented, with 3 Trolls clad in Porcelain Rocket framebags, and a Long Haul Trucker. Nick's Schwinn High Sierra flew the flag of 80s steel. 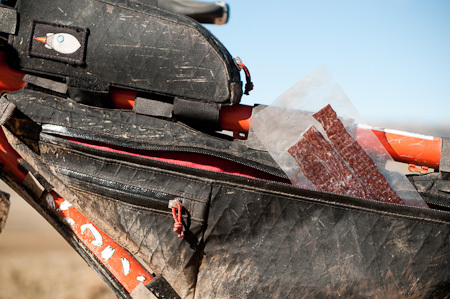 Talking of framebags... they're ideal for carrying jerky, a chewy, protein-rich US staple, omnipresent in every gas station across the state. These especially tasty salmon strips were posted to me all the way from Alaska. Thanks Marnie! Camping out on public land, enjoying the late afternoon sun and a game of frisbee. 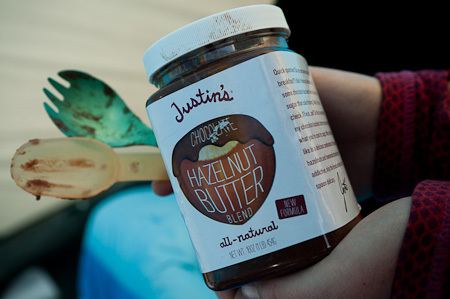 Refuel: guilt-free chocolate spread. Best eaten straight. With a spork. 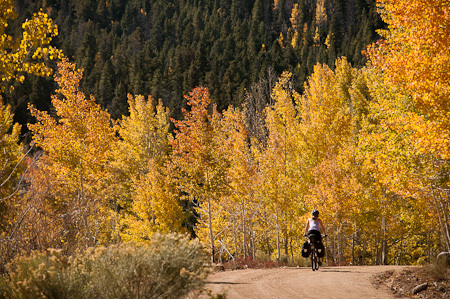 It's late October and we're on the cusp of winter, teetering on the knife edge of Colorado's incredible fall colours. 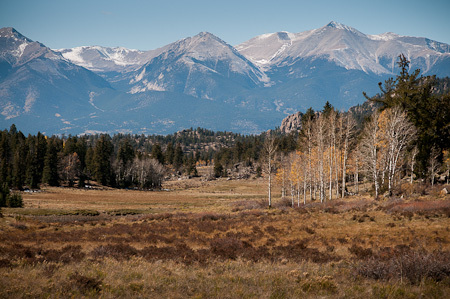 After climbing up through the San Isabel National Forest, we crested the watershed divide. 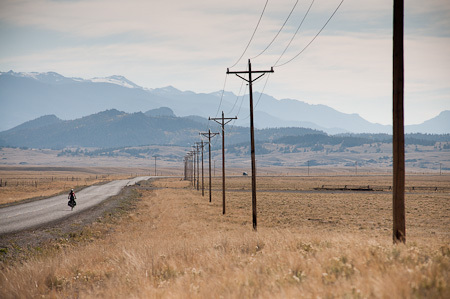 An imposing wall confronted us - the '14ers', the fourteen thousand foot peaks of the mighty Sawatch Range. ... with occasional breaks to take it in this incredible vista. 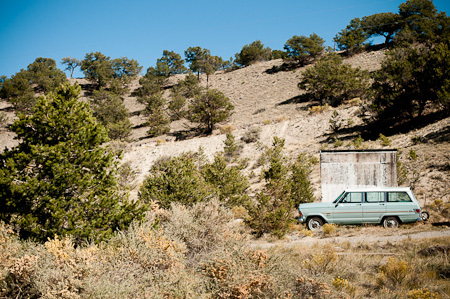 The outskirts of Salida - or Sa-Lie-Da, as it's pronounced locally, despite its hispanic roots. Downtown politics. This immaculate little liberal mountain enclave abounds in characterful coffee shops, hip galleries and independent stores. 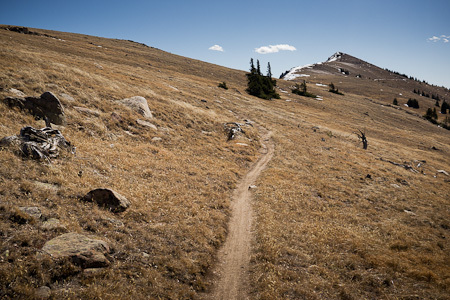 It's a mountain biking utopia, where bikes abound of all colours and creeds. 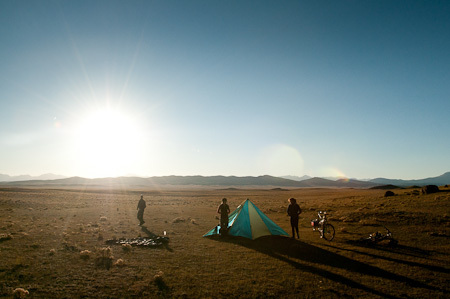 A sun-bleached Nick and two dusty dirt drop tourers. 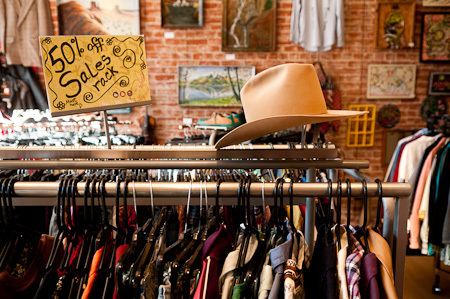 Thrift store shopping, cowboy style. 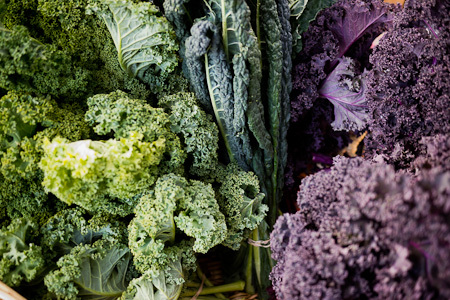 Fresh kale from the farmer's market. 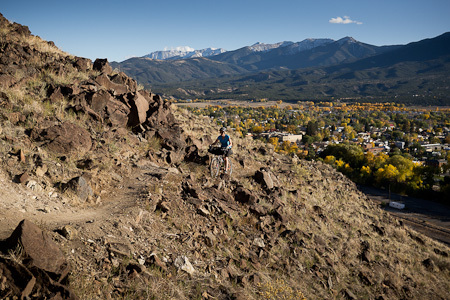 Salida enticed us with miles of mellow singletrack unwinding straight out of its historic downtown. We were staying a few miles out of the centre, with a Warmshowers host. 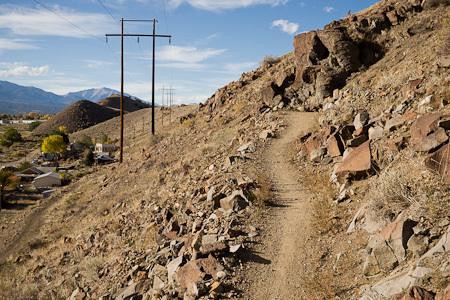 How many places boast singletrack like this you can ride home with your groceries? 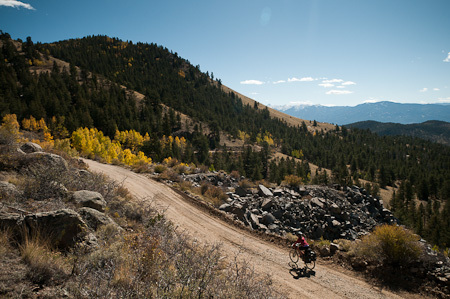 A little further afield, there's also the IMBA Epic Ride, the high altitude Monarch Crest Trail. We tackled it on our 'day off', rounding it off with the whirligig Rainbow Trail. A big day out! And finally, a lovely surprise. I'd stayed with in the wondeful home of Chloe and Alexei up in Sitka, Alaska, back in 2009. 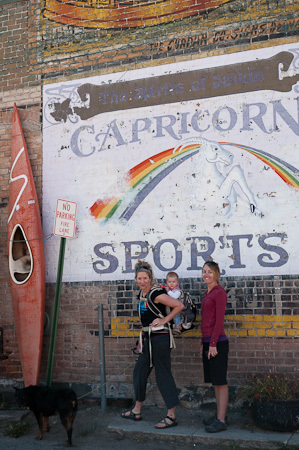 Chloe, who happened to be in Colorado, drove over to Salida to visit and introduce me to their lovely little baby, Phoebe Snow. I’m glad that you’re enjoying our state. 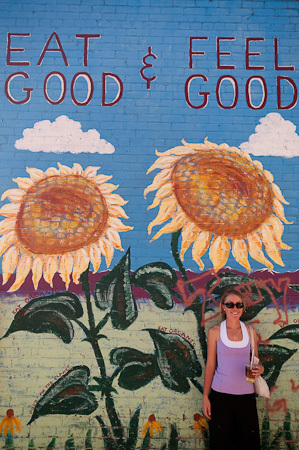 Your photos make me want to get out of Denver and head to the mountains. 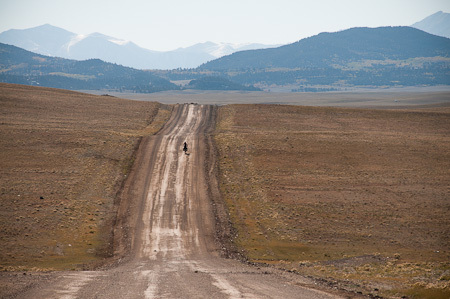 Looks great – I miss those trails on the doorstep of Salida. Glad you got to do Monarch Crest, it was snowed out when I was there. BTW, did you look on googlemaps at that stretch after Harsel? The whole area has been laid out in subdivisions, the ‘streets’ even have names. A vast city, just waiting for someone to actually want to move there, its quite fascinating. 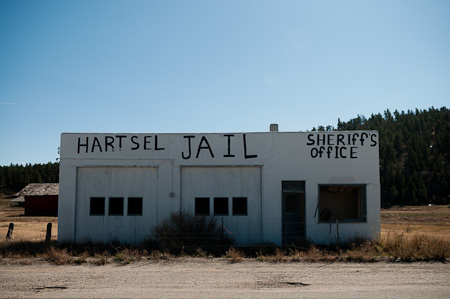 Apparently Hartsel only has 677 people at the last count, and it’s an ‘unincorporated’ town, so has its own tax/government? I think that being unincorporated means there are no municipal taxes? No wonder they can’t afford a proper Sheriffs office (it was just like that when I passed last year). And I don’t think they have any health inspectors either, my only illness on my whole trip was a very dicey tummy a few hours after eating in Hartsel (serves me right for ordering a veggie burger in a town like that). 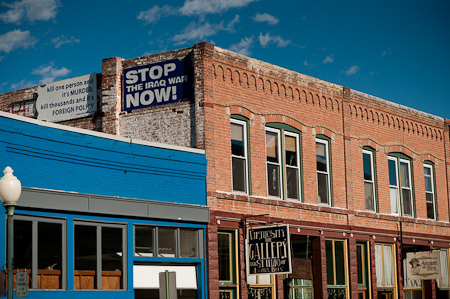 Incidentally, I didn’t get a chance to explore, but apparently those shops in Salida have a tunnel underneath connecting them all – it were used in the old railway days to allow ‘gentlemen’ to access the local red light area without being seen! Oh, and Monarch Crest still had some snow from a storm from a week before, but it was pretty patchy. Knee deep in the odd place though! 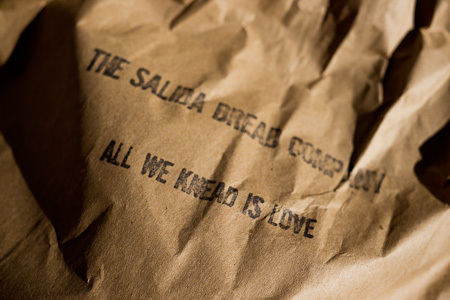 Great pics & read…look forward to the next! Susie, you sound like a jerky expert! What kind of meat is the Thai jerky made from? What kind of saddle are you riding with these days…and do you miss the old Brooks at all? Overall, I’m not too fussy about saddles. Certainly, the Brooks Imperial was incredibly comfortable. I’ve put a Gobi Wing Flex on right now, but that’s mainly because I pulled it off my mountain bike when I was at home. It’s probably not quite tough enough for a long trip, but it’s what I had to hand.